Christophe Lemaitre beat Britain's Dwain Chambers as he stormed to victory in the 100m at the European Team Championships in a personal best time. The Frenchman clocked a blistering 9.95 seconds in the showpiece event on the first day of competition in Stockholm. Welshman Dai Greene gave Team GB the perfect start with victory in the 400m hurdles and Jenny Meadows came second in a fiercely competitive women's 800m. Team GB lie fourth in the standings on 157 points with Russia top (213). Great Britain were always expected to struggle to keep pace with the favourites on the first day in Sweden, but some impressive individual performances mean they only trail third-placed Ukraine (160) by three points, while Germany are second on 183.5 points. British captain Greene led from the front, clinching victory in 49.21. And world and European bronze medallist Meadows did well to hold off Lilya Lobanova in her event but was unable to match winner Mariya Savinova's impressive kick for the finish line. He [Lemaitre] has so many advantages with his height and those long legs that keep striding past me...he is like an antelope! Chambers, 33, also pocketed 11 points with a commendable time of 10.07 but he never looked like overhauling 21-year-old Lemaitre, who improved his own French record by one-hundreth of a second. 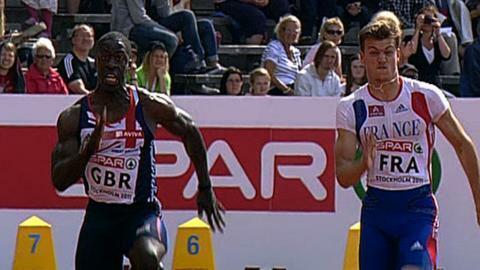 "He is fantastic for European sprinting," said Chambers. "He has so many advantages with his height and those long legs that keep striding past me...he is like an antelope!" "He is young and enthusiastic, but at my age , I just have to keep chasing him and focus on my own race." Lemaitre, whose time was a championship record and the fastest by a European since 2004, added: "I am very happy and very surprised - I didn't think I would beat my personal best again. "But I think I can run faster in Daegu [at the World Championships in August]. Of course it is very difficult with Usain [Bolt], Tyson Gay and Asafa Powell, but I think I can get to the final in the 100m and 200m, and hopefully be going for fourth or fifth place." Goldie Sayers secured second spot in the women's javelin with a superb throw of 64.46m, the third best throw of her career. There were also third-place finishes for Great Britain's Chris Tomlinson in the men's long jump (with a leap of 8.12m) and Perri Shakes-Drayton in the women's 400m hurdles. The men's 100m relay team rounded off the day's action with an impressive victory in a time of 38.60.